Livorno (Leghorn in English) has a new cruise terminal at the Calata Punto Franco called "Alto Fondale" (only used for "turnarounds") and is 0,5 km from the city center. Airports: Pisa 13 Km, Florence 80 Km, Railway Station: 3 Kilometres. From there, you can take Bus #1 "Stazione" to the train station. The bus ride is about 5 minutes. From there take the train to Florence, Lucca and/or Pisa. Validate your tickets before entering the train. Cruise ship shuttles directly to the station are 12 Euro. Heading for Pisa: Trains approx. every half hour. Get off at Pisa Centrale, buy bus tickets (1.10 euro) from the news stands in the central hall and take the bus right in front of the NH Cavaliere Hotel to "Torre" which means Tower. The whole trip from port takes less than one hour. Getting to Florence by Train: Doing it by yourself is usually (a lot) cheaper than an organized tour, and you will have a few hours in Florence, but if you are on a cruise make sure you get back in time for the ship's departure! Tip: If you are on a large cruise ship or if there are more cruise ships in port: Try to be one of the first to get off board, take (share) a taxi and take the train. Things otherwise might get very hectic. A ships organized excursion is the other option. Pisa and Lucca are not as far as Florence, and you can do things more leisurely. Printable map of Florence to take along. Printable map of Livorno to take along. Cruise calendar for this port and map of the cruise ship berths. Check here for festivals and events in Florence when you are in port. Most of the interesting bits of Livorno are within the old Porto Mediceo part of town (laid out by Florentine architect Bernardo Buonatlenti in 1567 on behalf of the Medici), still surrounded by its five-sided Fosso Reale canal. The canal is bridged in the east by an enormous vault called the Voltone, better known today as the huge rectangular Piazza della Repubblica, off the north of which you can see the Fortezza Nuova, which today is home to the city's most popular, if somewhat downtrodden, public park (open daily 10am-7pm). Via Grande leads west from Piazza della Repubblica, passing Via Madonna on the right, with its three baroque facades (no churches, just the facades) before spilling into Piazza Grande. The Duomo here, laid out in 1587, had to be almost entirely reconstructed after World War II bombing. The piazza used to be much longer, but a modern building has separated it from what's now Largo Municipio to the north, where you'll find the bell tower and double stairs of the 1720 Palazzo Municipio and, to the left, the 17th-century Palazzo di Camera. 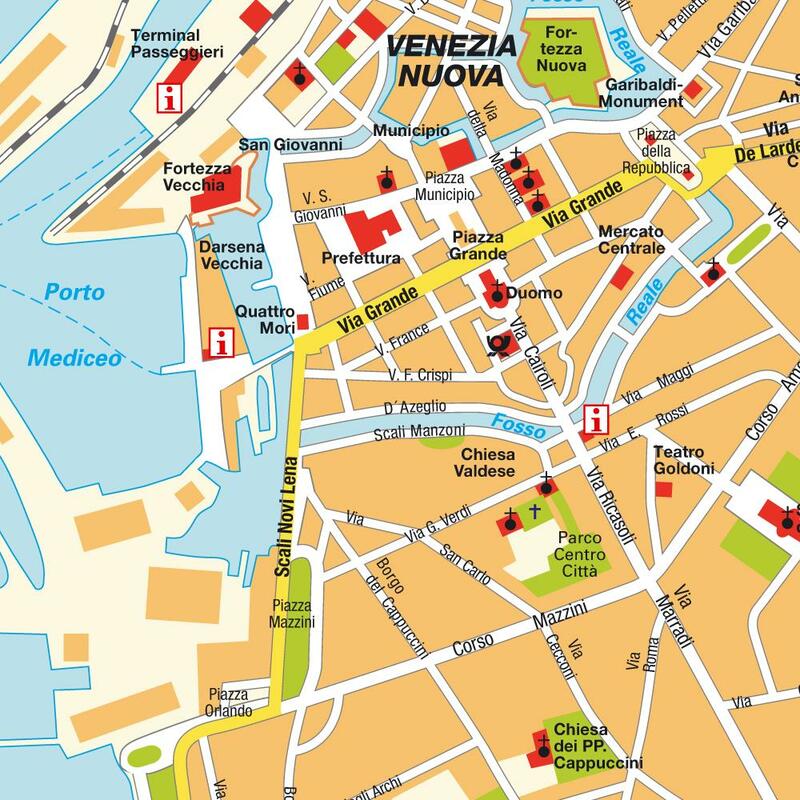 The tourist office is at Piazza Cavour 6. Livorno hop on/off tour. Runs til' October. An excellent way to see Livorno and especially to explore the surrounding area is to rent a car and head for the road! However driving in Italy is not for the faint of heart. If you are not visiting Florence, Pisa with it's leaning tower is within easy reach. Lucca: Imagine a beautiful little Tuscan town protected by massively thick 16th-century walls, featuring some of Italy's finest medieval and Renaissance architecture, superb dining, antique markets, classical and rock music festivals, easy access to stunning nearby villas in the surrounding hills and with endless beaches less than half an hour away. Lucca is one of Tuscany's best-kept secrets. With a little planning you can easily combine Lucca and Pisa. If you are planning to climb the tower of Pisa, buy your tickets in advance and choose a time slot. If you are a little cultured out, you might visit San Gimignano, a pretty medieval walled city in Tuscany. Rent a car. The heart of Livorno, leads straight to the town center from the port, and is full of excellent shops and stores offering quality goods of every kind at prices to suit all pocketbooks. This itinerary also leads to churches of different denominations, monuments (the two Fortresses and famous "Four Moors" statue) and the imposing piazza della Repubblica. Leather articles, shoes, silk scarves, ties and chic fashions for men and women can be found in elegant stores in Florence and to a limited extent in Livorno. Eat your way around Livorno! If you are a lover of Italian food, or just food in general, you can easily spend a day or a weekend in Livorno making your way around a selection of the many cafés, bars and restaurants There is a large street market, mercato centrale, with fruit, vegetables, clothes, shoes etc. just 2 blocks ( a 4-minute walk) from the tourist office. At the far end is a huge covered market. Go early for the seafood stalls. There is free WiFi in the terminal building, but if you are on a cruise call, there is no need to visit the this terminal. Free wifi is offered at many cafe's. Most shops and businesses in Italy open from Monday to Saturday from around 8am until 1pm, and from about 4pm until 7pm, though many shops close on Saturday afternoons and Monday mornings. Though most towns have a pasticceria open in the mornings, while in large cities and tourist areas, Sunday afternoon openings are becoming more common in Livorno, Pisa and Florence.